The French engineer Alexandre Gustave Eiffel is best known for the Eiffel Tower, which he built in Paris in 1889. Born in Dijon, Gustave Eiffel studied at the école Polytechnique and the école Centrale in Paris. He designed numerous bridges, the first in 1858 in Bordeaux, viaducts, and exhibition buildings; the ultimate in exhibition architecture came in 1889, when he built his famous tower in Paris. Throughout his life he was concerned with innovative structures and especially with the effects of wind loading on plane surfaces. He built an air tunnel in his laboratory at Auteuil for experimental purposes. Eiffel's most famous bridge, the Maria Pia over the Douro at Oporto, Portugal (1876), spans 500 feet by a single arch, 200 feet above high-water level, which with additional side pylons supports the horizontal superstructure. Also during that year Eiffel collaborated with the architect. L.A. Boileau the Younger on the Bon Marché Department Store in Paris, the first glass and cast iron department store. A glass wall along all three street facades, with circular pavilions at the corners, enclosed a store comprising open courts covered by skylights to an extent of 30,000 square feet. Slender columns supported balconies, bridges, and the glazed roof. The store still stands, although it has a masonry skin added in the 1920s. Eiffel's Garabit viaduct over the Truyère near Ruines, France, is 1,625 feet long and 400 feet high and has a central span of 210 feet. Other works by Eiffel include a revolving cupola for the Nice Observatory, and the structure that supports F.A. Bartholdi's Statue of Liberty in New York City (1886). An associate engineer on the Garabit viaduct, Maurice Koechlin, encouraged Eiffel in his design for the Paris exhibition tower of 1889. It was the factory-made components, fitted together on the site for the viaduct, that made the 984-foot-high Eiffel Tower possible. Each of the 12,000 different component parts of the tower was designed to counteract wind pressures, and 2,500,000 rivets were used to create a continuous structure. Four main piers, each with a slight curve, anchored to separate foundations incorporated elevators; two acted on a combined principle of pistons and chains, and the two American Otis elevators acted on a hydraulic piston system. Other hydraulic elevator systems linked the first level to the second one and the second level to the third. Jean Prévost, Eiffel (1929), the only monograph on Eiffel, is brief and in French. Two publications in English on the Eiffel Tower are Gaston Tissandier, The Eiffel Tower (1889), and Robert M. Vogel, Elevator Systems of the Eiffel Tower, 1889 (1961). Siegfried Giedion, Space, Time, and Architecture: The Growth of a New Tradition (1941; 5th ed. 1967), connects Eiffel with the development of structural techniques of the 19th century. 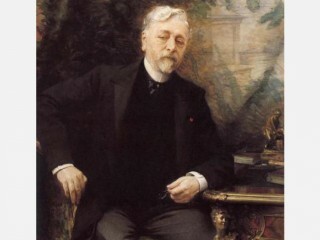 View the full website biography of Gustave Eiffel (En. ).